The Seychelles’ coco de mer is the stuff of legend. It is one of the many wonders of the island nation and considered as a giant in the plant kingdom. 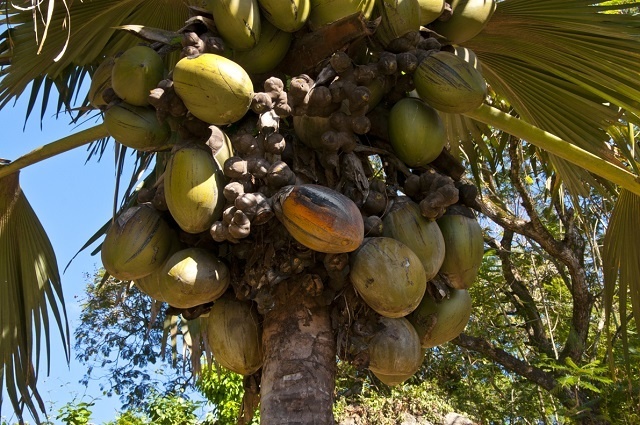 The coco de mer grows naturally only on two of Seychelles’ islands. On Praslin, the second most populated island, in the Vallee de Mai special reserve which is also one of the island nation’s UNESCO World Heritage sites, and on Curieuse, located very close to Praslin. SNA looks at 4 botanical records of the coco de mer. The most renowned feature of the coco de mer is its enormous fruit which is the largest in the plant world. The fruit takes between 6 to 10 years to mature and is generally two-lobed but may have four or even six lobes. It typically reaches a size of 40–50 cm in diameter. The fruit of the coco de mer typically weighs between 15 to 30 kg. The largest fruit recorded weighed 42 kg making it the world’s heaviest nut.